We’ve been holding out on you, Chicago. Ever since we announced plans for Time Out Market Chicago last year, we've been busy perfecting a lineup of the city's best chefs and restaurants. Now we're ready to reveal the first batch of names—and we're confident that it was worth the wait. The power-packed group includes Michelin-starred talent, beloved old-school haunts and some of the best new restaurants in Chicago. Time Out Market brings together the best of the city under one roof, offering dishes as varied as Chicago’s 77 neighborhoods. Guests will be able to choose from vibrant Vietnamese fare, loaded charcuterie boards, pristine fried chicken and whimsical ice cream creations. 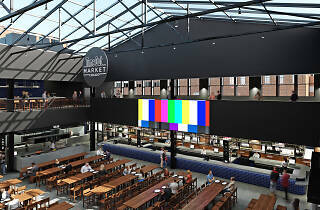 Take a look at the chefs and restaurants that will debut inside Time Out Market later this year. Brian Fisher: At Michelin-starred Entente, Fisher drops pretension in favor of approachability, offering a curated menu of beautifully executed, universally delicious dishes. The fact that he’s almost always blaring hip-hop music in the kitchen makes us love him even more. Market visitors can belly up to his counter for elevated yet approachable fare. Bill Kim: Considered an O.G. of Chicago’s fast-casual dining scene, chef Kim has been serving Chicagoans border-blurring fare for a decade (and counting). He’ll bring fan-favorite dishes like edamame dumplings and katsu udon noodle soup to the Market. Thai Dang: There’s something unapologetically authentic about HaiSous, the Vietnamese restaurant that chef Dang and his wife, Danielle, share in Pilsen. They’ll bring that same energy to Time Out Market Chicago through addictive dishes like fried chicken wings with caramelized fish sauce and grilled oysters with garlic confit. The Purple Pig: Every meat-eating Chicagoan knows The Purple Pig, chef/partner Jimmy Bannos, Jr.’s love letter to cheese, swine and wine. Though it opened on Michigan Avenue a decade ago, the beloved restaurant almost always has a lengthy waitlist. Time Out Market visitors will be able to order loaded charcuterie boards with mortadella, nduja, sopressata and more. Split-Rail: Chicago has no shortage of excellent fried chicken shops, but we fell head over heels for the earth-shatteringly delicious recipe at chef Zoe Schor’s West Town restaurant, Split-Rail. She’ll serve her crispy chicken, buttermilk biscuits and gooey green chili mac ‘n’ cheese at the Market. Mini Mott: We’re fairly certain that the folks at Mini Mott are adding something illegal to their burgers to make them taste so good. That shouldn't stop you from enjoying this Logan Square shop's signature creation: Patties topped with American cheese, hoisin aioli, pickled jalapeños, miso butter and a cloud of potato frizzles. Are you drooling yet? The Art of Pizza: You didn’t think we’d open Time Out Market Chicago without a top-rated pizza joint, did you? We tapped the folks at The Art of Pizza, who have been serving award-winning deep dish and thin crust pies for nearly 30 years. Grab a slice or order a whole pie from this iconic local favorite. Pretty Cool Ice Cream: Chicago’s best ice cream shops don’t have anything on this whimsical popsicle emporium in Logan Square, where Dana Salls Cree and Michael Ciapciak dream up inventive delights like red cherry party pops and coffee-pretzel-toffee custard bars. 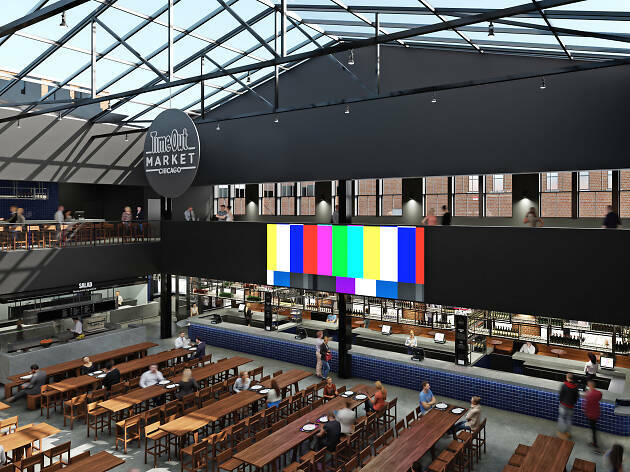 Time Out Market Chicago will feature 18 food concepts, three bars, a demo kitchen and a rooftop—all curated by Time Out Chicago editors. More details on additional concepts will be revealed soon. Plus, keep an eye out for Markets opening soon in London, Prague and Dubai.